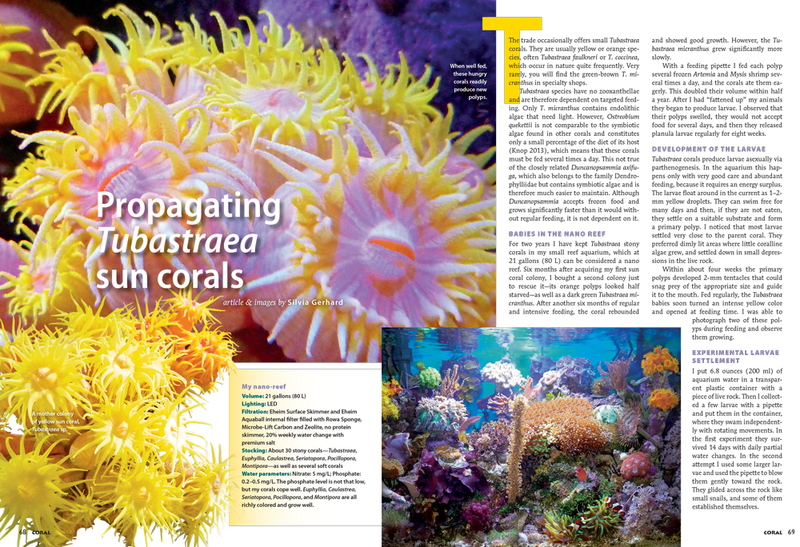 The November/December Issue of CORAL Magazine is printed and now delivering to print magazine subscribers, local aquarium shops. Here is a sample of articles and opening pages for readers wondering what the issue will deliver. 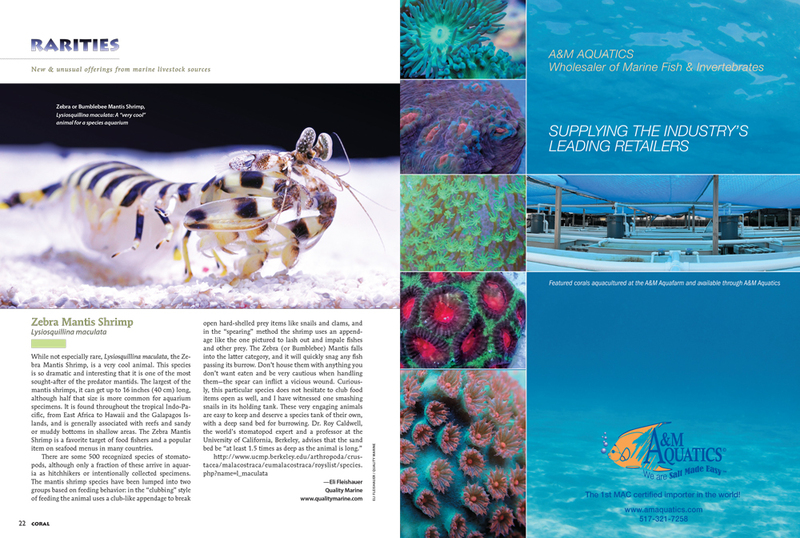 On sale date: November 3, 2015 at the best marine aquarium retail stores everywhere. REEF NEWS starts with a fascinating study from researchers on the Great Barrier Reef who observed a sophisticated system of cooperative feeding involved pairs of rabbitfishes. Previously assumed to require more intelligence than a fish possesses, this behavior has one member of the pair positioning himself (or herself) nose up in the water column, on alert for approaching predators while its partner grazes below, able to eat faster and more efficiently than foraging alone. The amazing behavior has been recorded in various species of Siganids. RARITIES leads off with the Zebra Mantis Shrimp, a smart and highly predatory crustacean that can make a spectacular pet in a species tank. Image by Eli Fleishauer who was keeping an eye on this big shrimp at Quality Marine. Everyone loves a surprise, says Robert M. Fenner, except when it happens to be a deadly little octopus hiding in a shipment of shells and rock. 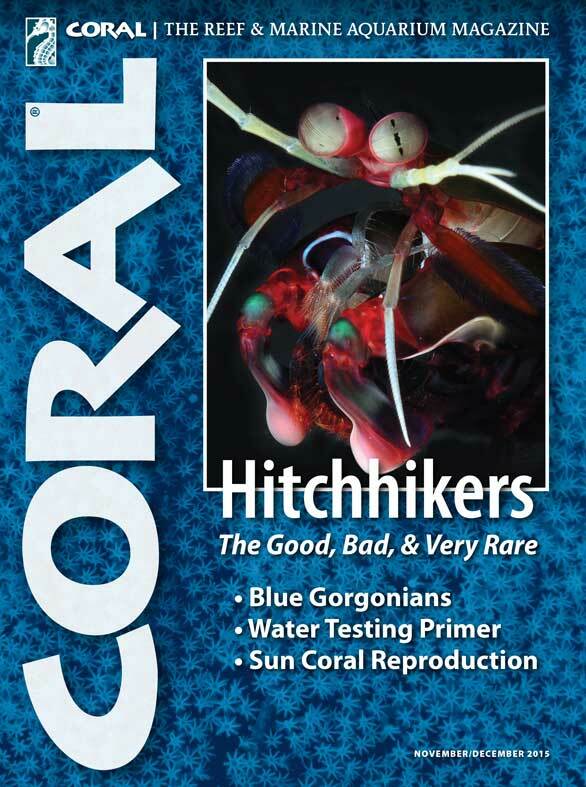 The author of the bestselling Conscientious Marine Aquarist offers an entertaining survey course in reef hitchhikers that saltwater hobbyists are most likely to encounter. Despite our best intentions, all manner of life forms can make their way into the warm, inviting waters of a reef aquarium. 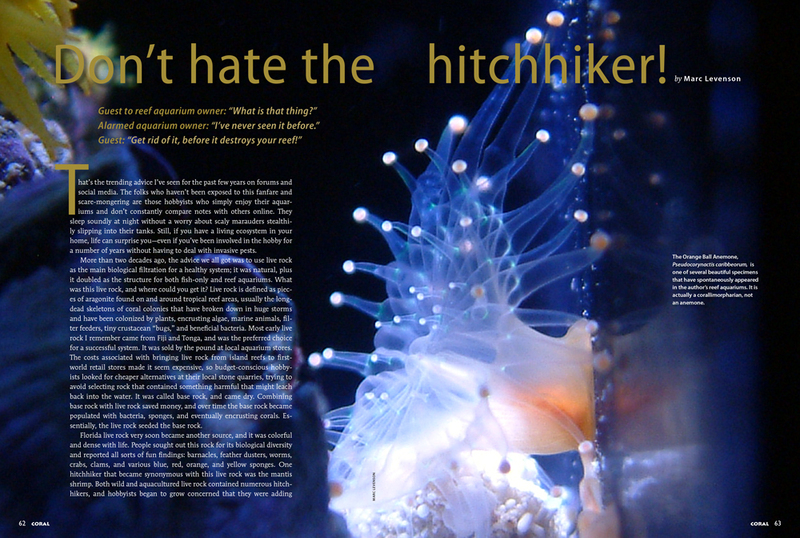 Invertebrate zoologist Dr. Ronald Shimek has spent years helping aquarists ID mystery hitchhikers, and here he offers a guide to identifying and better understanding the uninvited arrivals in your aquarium. 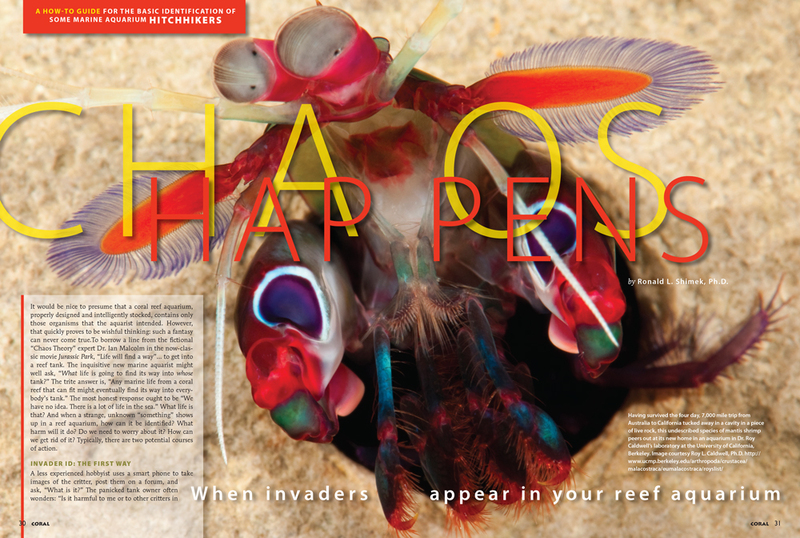 Image: Unidentified mantis shrimp from Australia by Dr. Roy Caldwell. 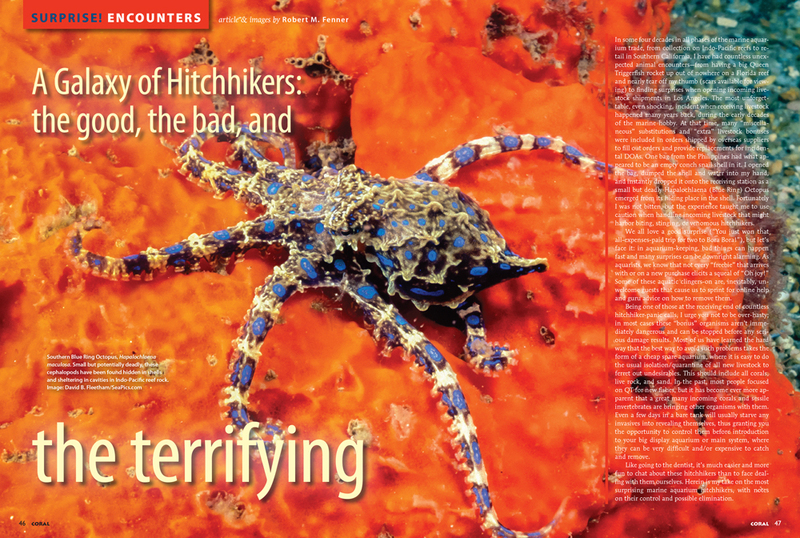 Professional coral culturist Than Thein offers readers a look at the woes caused by hitchhikers in a facility where pests can cause severe losses if not controlled—or kept out in the first place. A must-read piece for any serious SPS keeper. 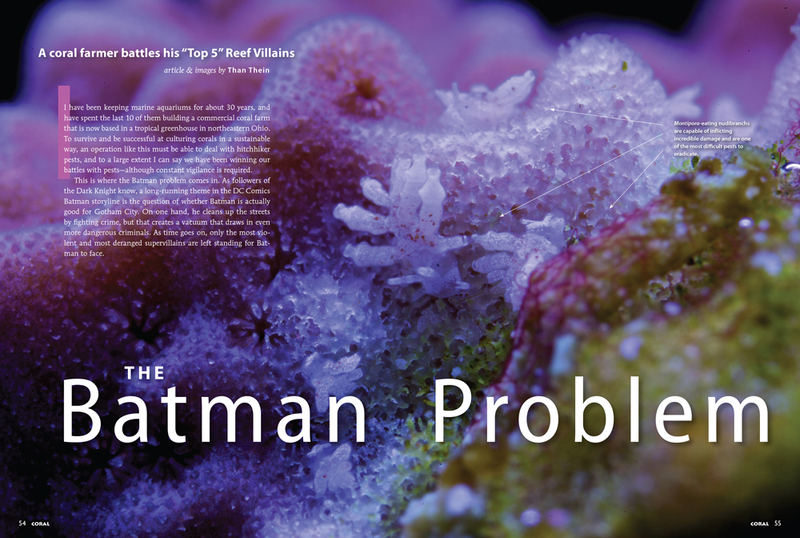 And now a word on behalf the Good Hitchhikers: expert home aquarist Marc Levenson argues that many unexpected arrivals coming in on live rock or growing on the base of purchased coral colonies are, in fact, very welcome, interesting, and sometimes valuable. 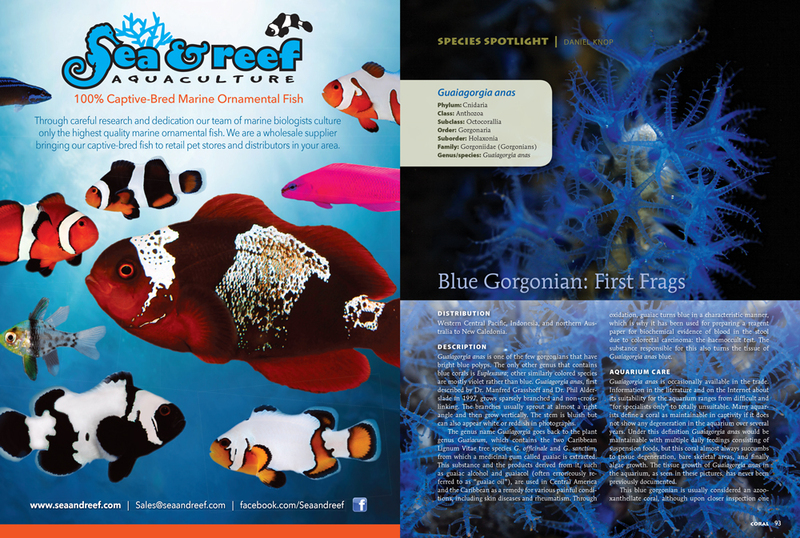 The diversity of “free” livestock in his own aquaria includes beautiful anemones, corals, and even a baby Tridacna clam. Images by Marc Levenson. 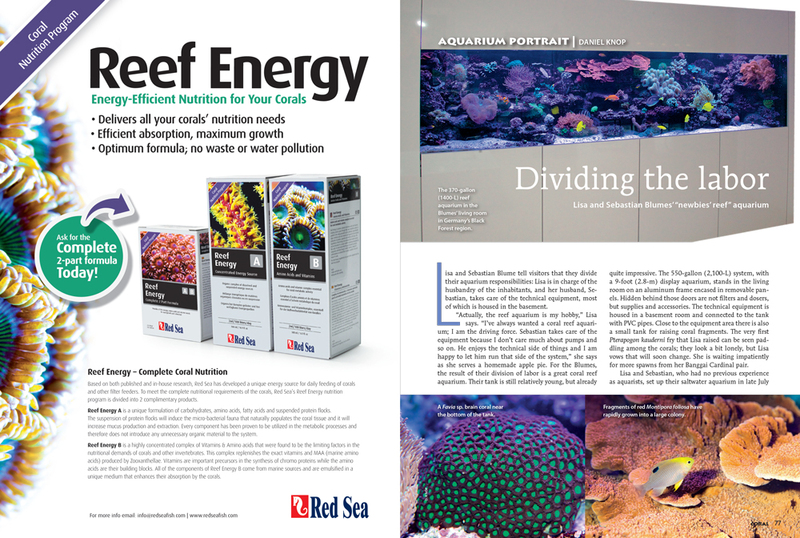 This issue’s Aquarium Portrait focuses on a thriving 370-gallon (1400-L) reef aquarium in the living room of Lisa and Sebastian Blume in Germany’s Black Forest region. 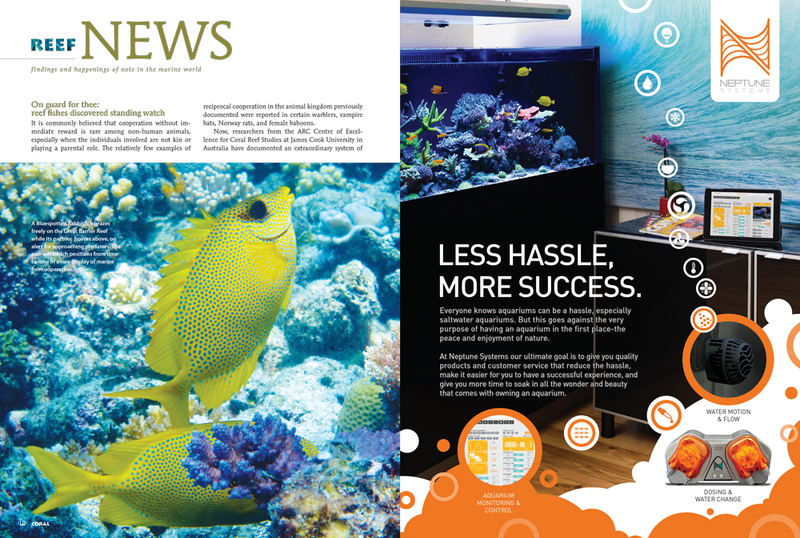 Theirs is unusual story: the couple share the reefkeeping duties and this is their very first reef aquarium. Images by Daniel Knop. Feed your Sun Corals, Tubastraea spp., and they are not difficult to reproduce says amateur aquarist Silvia Gerhard, whose article is sure to inspire others to try her uncomplicated methods. Images by the author. 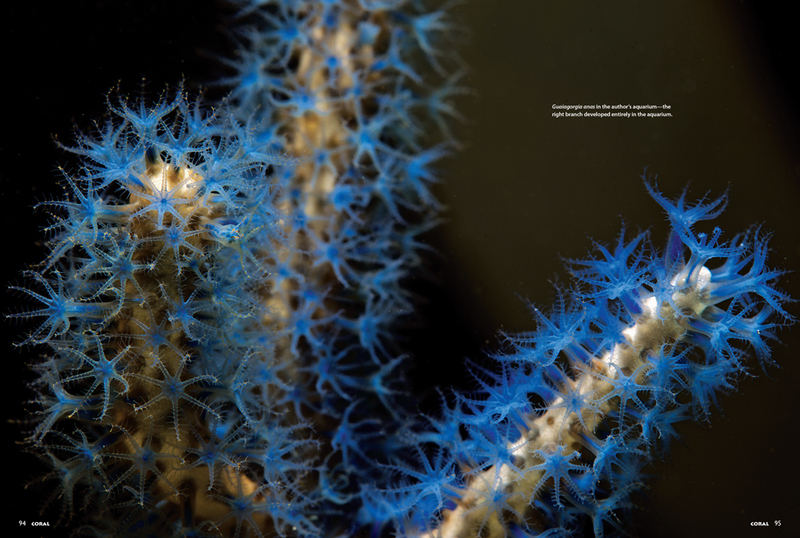 Daniel Knop, editor of KORALLE, the German parent magazine of CORAL, goes well beyond his usual “Species Spotlight” Department as he documents how he has succeeded in keeping and fragging the beautiful Blue Gorgonian, Guiagorgia anas. Closeup of the stunning blue polyps of Guiagornia anas in one of Daniel Knop’s experimental home aquariums. Image: D. Knop. 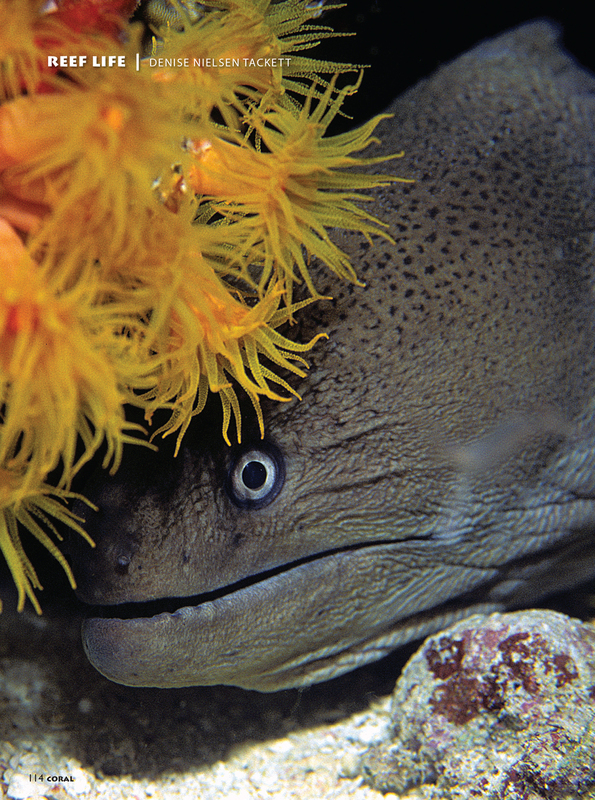 Wakitobi Marine Park, Indonesia White-Eyed Moray Eel, Gymnothorax thyrsoideus, seeks shelter beneath the polyps of a night-blooming cup coral, Tubastraea sp. Photograph taken in Wakatobi Marine Park, Indonesia, by the late Denise Nielsen Tackett, 1947-2015 for the Reef Life Department in CORAL, which will continue under the stewardship of Larry D. Tackett.